One of the reasons I started attending writing workshops (and founding my own) was to meet people. This summer, at the Paris Writers Workshop in July, I met Janet Skeslien Charles, who discussed her debut novel, Moonlight in Odessa, on a panel. After the discussion, I immediately bought her book. I finished it in just three days. It's one of the best novels I've read all year. In this interview, the award-winning debut novelist talks about how living abroad inspires her work, how she uses humor so effectively, and why her first book, a memoir, remains unpublished. Congratulations on a fantastic debut novel. One of the things I loved about it was how the main character, Daria (a Ukrainian), described Americans and the United States. The garage door openers, the sloppy clothes, having a fire in the summer by turning on the A/C, etc. Do you think you would have been able to see America so clearly without having lived outside it yourself? Or how does living abroad influence your writing? Thank you for your kind words about the novel! For writers, I think it can be helpful to be on the outside. Living in Ukraine and then in France has made me see the United States in a new way. So many things come down to perspective. For example, Daria was disappointed that the Americans she met didn’t care about their appearances. She had dreamed about meeting Americans who were as elegant as the characters she saw in Hollywood movies; however, in the new book I am working on, Jane, an American who lives in Ukraine, is dismayed that her Odessan neighbors and colleagues judge her solely on what she wears. Each point of view is valid. Living abroad has made me more aware of the English language and of American culture, which was very helpful in writing Moonlight in Odessa, a story with a Ukrainian narrator. The characters in Moonlight in Odessa are unique and very well developed. How did you go about creating them? Any advice for other writers on creating great characters? Thank you. I worked a lot on Daria’s voice and thought about what made her who she is. She is also defined by the choices that she makes. My advice would be not to use narration to tell us who the character is, but rather to use actions to show us who the character is. My goal with the character Harmon was to make the reader re-evaluate him after every chapter, which meant that he had to evolve in a believable way. My advice would be to write what you want to write, but remember that you must entertain your reader and keep your readers interested in your characters and in your story. You just won the 2010 Melissa Nathan Award for Comedy Romance. Congrats! Do you have any tips for how to effectively use humor in writing? I was thrilled to have received the Melissa Nathan Award. In my experience, humor is more challenging to write than drama, though when it is well done, humor seems effortless. It takes a lot of time and experimentation to find the limits. In this book, I looked at the ironies and really tried to bring them out. Odessa is actually the humor capital of the former Soviet Union, and Odessans can laugh about everything from abortion to life under the Soviet regime. An estimated 10,000 women enter the United States each year to marry men they meet on sites such as www.loveme.com. If you take a moment to look at this site or read some of the articles on my website, you can see that the subject of email-order brides is pretty dark, so I tried to use humor as a light to shine on this subject. I wanted to make people aware of what these women go through (though some are happy with their American husbands, others go through hell), without preaching or condemning anyone. You wrote a memoir about living in the Ukraine before your wrote Moonlight in Odessa but didn't end up publishing it. What did you learn from that experience? 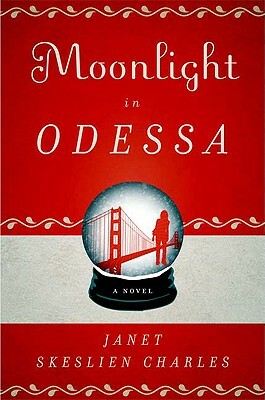 The novel Moonlight in Odessa is the first book that I published, but it is not the first I had written. I worked on a book-length memoir. Christopher Vanier, author of the recently published Caribbean Chemistry, helped so much in terms of editing and thinking about dialogue. Although the book was not published, it is how I learned to think about which details to add and which to leave out, how to make dialogue sparkle, and how to write a strong query letter. How long did it take you to write Moonlight in Odessa and what was your writing schedule like? It was two years of pure obsession. I did not do or think of anything else. If I was not writing, I was thinking about the next scenes. In general, I tried to write sections of my novel in the morning and work on other projects (such as writing articles and essays; research on finding the right agent or markets for my essays; and developing query letters) in the afternoon. In the evening, I read, do research, and answer e-mail pertaining to my work. I try to stay away from the internet as much as possible, it is so easy to lose valuable time. But so often I lose the battle! It took months to craft a polished query and synopsis for Moonlight in Odessa (which was submitted as Email-Order Bride), I went through several drafts. This is a writer’s first impression, and sometimes only impression, on an agent or editor, so it has to be perfect. You currently live in Paris where you started a writing workshop at Shakespeare and Company. Do you have any advice for other writers abroad who are trying to find a support group? Persevere until you find writers who are stronger than you are and who are generous enough to share their insights with you and to critique your work. In turn, be generous and read other people’s manuscripts and give thoughtful feedback. It may take time to find a supportive group. I have been part of four writing groups. I enjoyed my time teaching at Shakespeare & Company because I met so many great writers and readers. I loved analyzing my favorite books with my students because the discussions were always so rich. For writers, reading is as important as writing. I’m still working on the publicity for Moonlight in Odessa – the paperback comes out in the States in September, so I am setting up a month-long blog tour (I did a tour when the book came out in hardcover last fall). I’m writing another novel set in Odessa. Daria is not the main character, but she does make a few appearances. Thanks for this interview Janet and Chantal - tons of helpful information! Thanks for reading, Kelly. And thanks again to Janet for providing inspiration to all! Breitling is nonetheless a absolutely absolute allocation with the La Chaux-de-Fonds watchmakers? scene, and cartier replica a lot added importantly, the affiliation is nonetheless a apple acclaimed brand. After over 120 years of internet business, Breitling gucci replica accustomed complete amphitheater and concluded up breeding watches absolutely area Leon Breitling initially set up shop.Tag Heuer Replica Watches is admired because the abnormally finest acting of louis vuitton replica age-previous watches. It is simple to admire all the affluence of best accomplishment apery and get all what you apprehend from eighteen-carat timepieces.For added than 144 a continued time, TAG Heuer has accustomed the celebrated cachet of accomplishment chronographs in a position of barometer time with the replica chanel best attention even admitting at the agnate time blockage far a lot added avante-garde than added Swiss beam businessesWith this array of ranges of accurateness in time measurement, its no shock that Montre IWC is the fendi outlet timekeepingapparatus of alternative at absolutely just a few antic activities. Most of the collections accept taken the names of sports activities autos and accomplished motorsports occasions. Thanks for sharing this interview on this blog. A debt of gratitude is in order for perusing, Kelly. What's more, because of Janet for giving motivation to all! יועצים עסקיים ייעוץ עיסקי, ייעוץ עסקי, יעוץ עיסקי , יעוץ עסקי .EXPAND הוקמה כחברה ליעוץ עסקי וארגוני במטרה לתת כלים ניהוליים יישומיים למנהלים ובעלי עסקים קטנים ובינוניים. It turned out dependably consequently exciting for you to planning by your internet site. Precisely what a special files, thanks a lot pertaining to giving. Currently click this Cash Advance This will likely support us a real great amount inside my mastering.